Credai Bareilly chapter has joined the initiative of Bareilly Development Authority to save sparrow and sponsored WORLD SPARROW DAY event organized by BDA, held on 20 March in Sanjay Community Hall of Bareilly. On this occasion, in a statement given to media, Senior Vice President of CREDAI UP and President of Bareilly Chapter Mr. Ramandeep Singh said that sparrow is an endangered bird and we can even now save it from being a subject of history like dinosaur. He appealed the people to put small “Sparrow Huts” at suitable place of their houses to shelter this beautiful bird. More than 500 Sparrow Huts made of wood were distributed at event-venue to the sparrow-lovers. Students of many schools participated in Sparrow-Poster competition and prizes were given to the winners. Rang Vinayak repertory played a heart-touching drama on sparrow. A photo exhibition also took place there. Dr. Shashank Vikram (VC-BDA) welcomed the guests in the function held in Sanjay Community Hall. Addressing the audience chief guest Mr. Ashutosh Kumar (DIG Bareilly Range) highly appreciated the efforts made by the organizers and sponsors to spread the awareness on the need of sparrow-conservation. Dr. Jagmohan sr. scientist CARI touched various aspects and issues related to sparrow through his power point presentation. 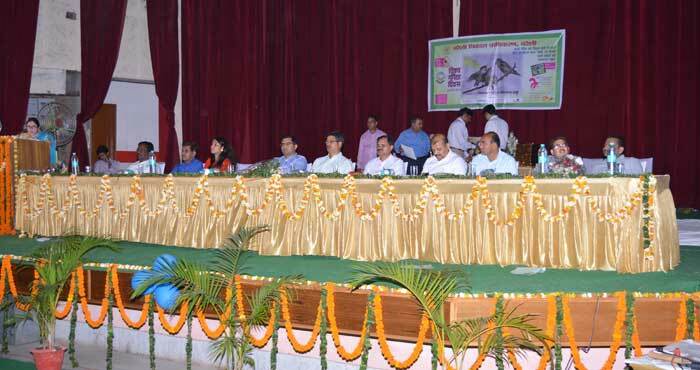 Mr. Dharam Singh, DFO, apprised the audience of the utility and success of Huts in attracting the house –sparrows. Mr. Ramandeep Singh (President-Credai Bareiily) and Mr. Sunil Gupta (Secretary- Credai Bareiily) were special guests of the function. At last Mr. Hardeep Singh Oberoi (Member-Credai) delivered the vote of thanks. Besides Dr. Garima Yadav (Secretary-BDA), and Mr. Ajay Singh (Chief Engineer-BDA), members of Credai Mr. Vipin Agarwal, Mr. Harpreet Singh, Mr. S.S. Rathore, Mr. Rajesh Agarwal, Mr. Dharmendra Gupta, Mr. Rajesh Gupta etc. were also present on this occasion.